Magnolia Birthday Card using Remarkable You stamp set from Stampin' Up! Today's card is perfect for our 'nearly spring' days here in Melbourne. 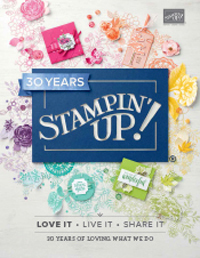 This Magnolia stamp is one of the four floral images in the Remarkable You stamp set from the 2015 Stampin' Up! Annual Catalogue. I have water-coloured the image using my aqua-painters and the ink inside the lid of my Rose Red ink pad. I wanted the flower to stand out, so all I needed was some neutral bits and pieces to complete my card. 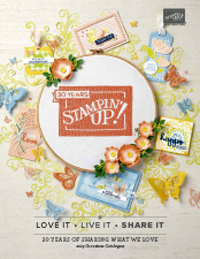 My greeting is from Happy Happenings sentiment stamp set in the 2015 Stampin' Up! Annual Catalogue. Love the font on this one. You can view all the products I have used in today's card by clicking the links at the end of today's post. Today some of the Art with Heart Stampin' Up! team girls are presenting some fabulous Father's Day ideas to inspire you. We also have our brand new 2015 Holiday Catalogue available from 1 September, with some amazing Christmas inspiration for you. Be sure to request a catalogue today! 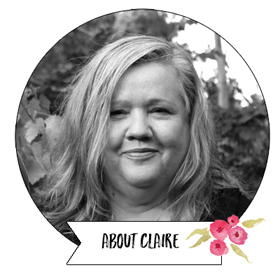 If you would like to join a fun and friendly team to meet new crafty friends or earn money selling Stampin' Up!, let one of us know along the way as we love to welcome new people to the team. I have a couple of projects to show you. This first card is for my husband from myself and the boys. I have used a few different sets, but the main one is the new Words of Truth stamp set in the 2015 Annual Catalogue. It's perfect for all things male and teens and lots more. I've also used Gorgeous Grunge and Banner Banter (which coordinated with the Banner Punch). Here's the inside of the card which shows some more of the Words of Truth stamp set (all except the Happy Fathers Day sentiment re from Words of Truth). Love the Everyday Chic Washi Tape too! My next project is for my Father in Law (my own Father has sadly passed away). For this card I used the Guy Greetings Stamp set, another fabulous choice for male cards. My colours are Mint Macaron and Early Espresso I love the shoes sentiment in this Guy Greetings set. Here's a closer look at the two main stamp sets I have used today. Both of these stamp sets can be purchased in my online store 24/7. Next up on the Art With Heart Team blog hop is my team member Judy May. I hope you have enjoyed our blog hop today and feel inspired to make a handmade card for Christmas. Hello stampers! Hope you are having a lovely day. Today I wanted to show you a super quick and easy card layout I have used quite a bit with cards. I love how it's turned out with the black background and contrasting papers in the black toned papers in the Pretty Petals DSP stack. Card base is a side folding standard size card. Stamped panel is height of card and 4.7cm (or 1 & 7/8") wide. Horizontal DSP piece is 13.5cm (or 5 & 1/4") in length and 4.5cm (or 1 & 3/4") in width with two corners rounded as shown. Stamped piece is adhered with Stampin' Dimensionals, everything else with Snail or Fast Fuse. Sentiment is die cut from Greetings Thinlits using Mint Macaron. Side piece of DSP is 1cm wide (or 1/2") with half adhered under the stamped panel. See? Super simple right. I hope you enjoy making it up. I've linked to all the products below. I've got my big box of Holiday catalogues ready to be mailed. If you don't already have a demonstrator and you would like to receive a Holiday Catalogue in the mail, just let me know by completing the form HERE. I'd love to help you get into some Christmas crafting this Holiday season. Stamp Clubs starting soon: Would you like to create 3 projects a month along with me from home? My next round of Stamp Clubs (all by mail and email, so join from anywhere in Australia) are starting in September and you get free catalogues, materials sent and tutorials for three projects a month. Small product sample included each month and the month you are hostess you get a minimum of $50 free product. Check out all the details HERE. It's been a fabulous 12+ months with the team and I am so grateful for the fabulous opportunity. I know I will be friends with these lovely ladies for many years to come. There will be lots more free paper-crafting inspiration coming your way from my blog, because if anything, I will probably have more time to create with just a blank piece of grid paper as my starting point. I am really looking forward to that. If you haven't already, make sure you subscribe to my blog posts (posts will be sent to your email) so you don't miss a thing. So today we have my last Stamping and Blogging card, SB117. I really like how my colours worked out in this one. I've used Mint Macaron and Blushing Bride for my stamping, picking up the colours from the beautiful English Garden Designer Series paper. Bruhstrokes is a great background stamp. In this case I stamped off once, as it would have been a little too heavy for my card otherwise. So now for the last time, let me direct you to the lovely Stamping and Blogging design team girls to see what they have done with this week's sketch. Lee and Erna are on holidays this week. So there you have it. I hope you have enjoyed this week's blog hop. See you back here soon with some more creative ideas. Before I go, I wanted to let you know my next stamp club is starting soon. Would you like to create 3 projects a month along with me from home? 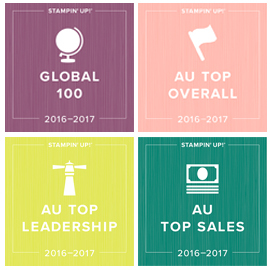 My Stamp Clubs (all by mail and email, so join from anywhere in Australia) are starting in September and you get free catalogues, materials sent and tutorials for three projects a month. Small product sample included each month and the month you are hostess you get a minimum of $50 free product. Check out all the details HERE. Another quick and simple card today using Stampin' Up! Wild About Flowers stamp set and the Greetings Thinlits. The flowers and stems on this Photopolymer stamp set are separate (so you can add various flower heads), but it's super easy to line them up with the guide on the stamp. This made the stamping off really easy as I just did the leaves first and the flowers. The triple banner punch made cutting the banner ends super easy, and then it was just popping the die cut sentiment on top. Here's today's colour combination. I'm rather partial to this one. It seems fresh and summery in a cold Melbourne week. Have a fabulous day and I'll see you back here again tomorrow.